Are you getting excited yet? Christmas is coming! The year is winding down, the weather is changing and the shopping is beginning. Let the holiday cheer and festivities into your home with some of this years fabulous Christmas essentials. Get decked out and cozied up and enjoy the holiday spirit. We received a variety of samples and/or compensation for inclusion. All opinions are our own. Love to bake (or simply enjoy) all the goodies that come with the holidays? It’s one of my family’s favorite holiday traditions is getting into the kitchen together and baking up treats for all the family gatherings. Foodstirs lets you get in the kitchen as a family and bake something wonderful (and oh so cute!) without all the fuss of figuring out what to make and gathering tons ingredients. Buy an individual themed baked good kits for the holidays or join a monthly subscription to get a perfectly curated treat for just $19.95 a month. Their adorable treat of the month is a Brownie Snowflake Kit that include brownie mix, decorations, and directions! 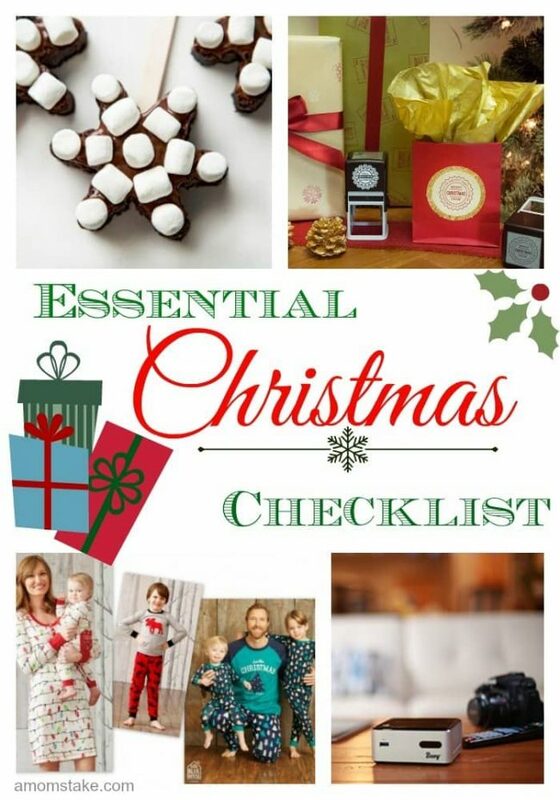 Visit Foodstirs and add baking something yummy to your holiday checklist! Planning on attending Holiday parties? You want to make sure that you look your absolute best; and nothing quite dresses up your appearance like beautiful personalized jewelry. Specializing in customizable necklaces and bracelets, Merci Maman’s beautiful accessories are a must for every Holiday get-together. Whether you choose to customize your pieces with names, dates, or words, Merci Maman hand engraves every piece of jewelry. One of my absolute favorite Merci Maman pieces is this Personalized Leather Wrap Bracelet & Infinity. Available in a variety of colors such as pink, silver, brown, orange, and black, this leather bracelet ads the perfect stylish touch to every outfit. Be sure to visit Merci Maman for more personalized options. I love chilly winter weather that accompanies the Holiday season. For me, chilly weather means one thing – layers. Thankfully, No Nonsense offers a wide variety of leggings, tights, and socks to keep you warm and stylish this Holiday season. Whether you choose to layer with No Nonsense’s Multi Floral Tights or Corduroy Leggings, you’re sure to make a statement with any wardrobe. Not to mention, No Nonsense’s products are all extremely comfortable. What could be better than looking stylish AND staying comfortable during the Holidays? Available in a variety of colors, patterns, and designs, you won’t want to miss out on No Nonsense’s tights, leggings, and socks. Sparkle your way through the Holiday season with Laurel Elliott’s beautiful inscribed jewelry. Inscribed with uplifting messages such as “love you always” and “live your dream” you will instantly fall in love with these timeless accessories. Some of my favorite Laurel Elliott pieces include the Love You Always Sterling Silver Necklace and Pure Mobius bracelet. Wearing these beautiful jewelry pieces truly dress up every outfit. Made from quality sterling silver, everyone woman deserves to feel beautiful wearing Laurel Elliott’s jewelry. For thoughtful and beautiful Holiday gifts, be sure to visit Laurel Elliott and browse their Christmas and Hanukkah sections. One of my the best holiday traditions is Christmas jammies! I love seeing my kids all dressed up in festive pj’s on Christmas Eve, but the cuteness doesn’t have to end there. The whole family can be decked in Christmas pajamas — ready for the magic of Christmas morning to come. Hatley has an adorable selection of matching, coordinating, and varied styles that will let you pick out something for your whole crew based on your personal preferences. I love the Northern Lights styles with strings of Christmas lights stretching across the fabric available in a cozy long sleeved nightgown for mom and mix and match styles for the rest of the family. Visit Hatley’s website to purchase a set of Christmas jammies. Nothing quite brings the Holiday spirit like Christmas tunes. Thanks to the Casio CGP-700 Compact Grand Piano, you can play your Christmas tunes with fun built in sounds such as guitar, organ, bass, brass, and more. With fun tunes and rhythms to add to any song, your family can enjoy piano music like never before. There are so many things that I adore about the Casio CGP-700 Compact Grand Piano: its easy portability, the touch-sensitive keys (making it feel like you’re actually playing a grand piano), color graphic touch display, and incredible sound. My little son love to turn it on and dance to the wide variety of songs. The Casio CGP-700 Compact Grand Piano is the perfect Holiday addition for every family. The Polar Express is a beloved Christmas tale for millions around the world. When a young boy boards a mysterious train headed to the North Pole in search of his Christmas wish, he is surprised to receive the greatest gift of all, the gift of believing. In this 30th anniversary edition, the art of Chris Van Allsburg is revealed in a never-before-seen fashion, with a new jacket design and expanded interior layout. Includes author’s note, downloadable audio read by Liam Neeson, and golden “All Aboard” ornament. It is the perfect keepsake for your family or gift for friends and neighbors. Make sure to tag #readandbelieve as your enjoy your book, each time the tag is used on social media Houghton Mifflin Harcourt will donate a copy of the book to Christmas in the City, a nonprofit organization that helps families in need. Three Designing Women make a beautiful customized stamp for any occasion. Use one to add a little personality to your things things this year. These stamps are self-inking and can be customized to stamp your personalized message in your choice of colors. They have stamps for the office, for addresses, weddings, monograms or even labels for gifts or books. Whatever your stamping needs, Three Designing Women have a self-inking customizable stamp for you. Minted has gorgeous designer-created holiday photo cards to help you get out your end of the year greetings to family and friends this year. Choose your favorite design and start customizing by adding your family name, greetings, photos, or even make a unique Minibook cards which have 7 pages you can customize all packed into a standard 5×7 size with no extra postage needed. If you’re the type that likes to add a letter to your cards, this is a really unique and modern way to add your Christmas letter this year mixed in with photos. Or, spruce up your space with one of their gorgeous foil stamped wall art prints. Minted can also help you get organized for the new year with their planners and address books. 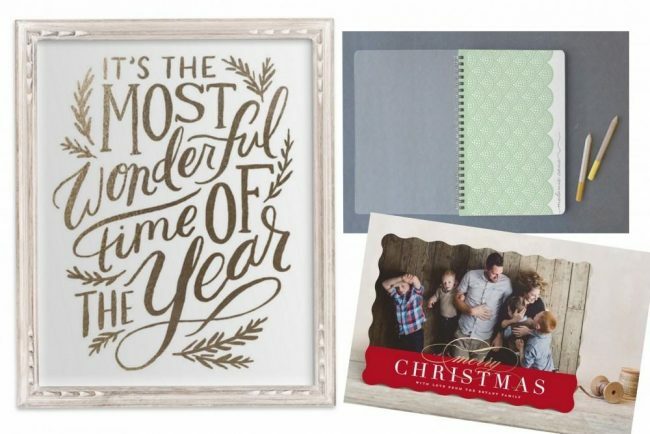 Turn to Minted for all your art and stationary needs this holiday season. One of my favorite Holiday traditions is gathering around the table and playing games with my family. Perfect for family gatherings, Wonder Forge offers a variety of games perfect for every member of the family (with most games perfect for ages 4 +). With choices such as Pictopia Star Wars Edition Family Trivia Game, The Peanuts Movie Snoopy Flying Ace Game, and Eye Found It! Journey Through Time Hidden Picture Game, your entire will stay entertained for hours. One of my son’s personal favorites includes Wonder Forge’s Apple Pop Game; using a spoon to pop apples out a tree has never been so fun. Bond with your family this Holiday season over board games from Wonder Forge. As my grandparents age, they opt out of more and more of our family gatherings, but we still want to stay connected with them and make sure they are taken care of. Families can help ensure that grandparents and elderly parents have the tools at hand to connect with their family and loved ones. With grandPad, they can stay connected to the digital world without all the confusion and frustration that can come with advanced technology that the elderly aren’t quick to learn how to navigate and use. 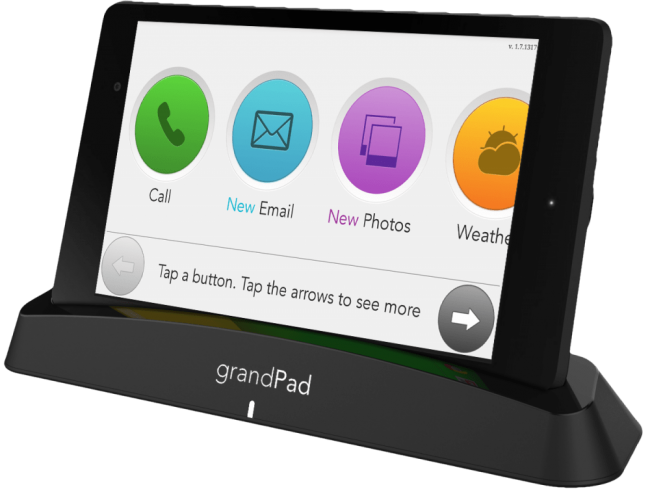 The grandPad tablet is specifically designed for seniors with a simple, easy to navigate interface that they can understand and benefit from. They will be able to make a phone call by tapping a picture, send and receive emails, view family photos/videos that are can be synced from loved ones devices, play games single player or with family members, check the weather, and more! Throughout the holidays you’re bound to capture tons of priceless moments of your loved ones. Whether that be a priceless crying on Santa’s lap picture, a family member unwrapping a gift they were longing for, or the perfect family snapshots you added to this year’s Christmas cards. No matter what pictures you are taking, you want to protect and secure your photos, and not clog up your phone’s storage space. 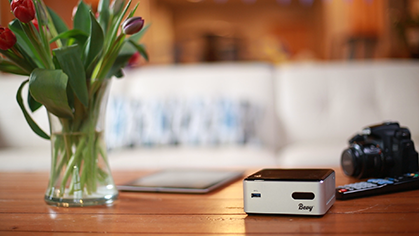 Enter Bevy, a smart photo storage solution, that includes an app for easy uploading and viewing of your photos as well as a connected storage drive that will store, sort, and organize all of your family member’s photos into one location. You can then scroll through all the uploaded images through the Bevy app and enjoy all the moments created together. When you have little ones, an absolute essential for the Christmas season is a trip to visit Santa! There is something so precious about a picture with Santa (whether there are tears or smiles). 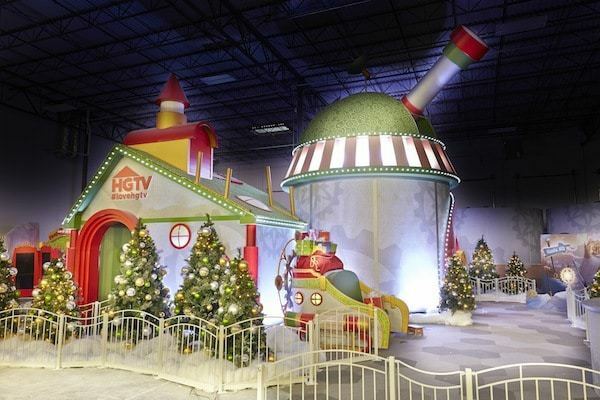 HGTV presents Santa HQ where local malls are transformed to a winter wonderland with Santa himself stops by for a visit. As you enter the booth, you’ll start with a Naughty or Nice O’ Meter and you’ll have a chance to snap an “Elfie Selfie” while you star in your own holiday video. Next, you’ll head through a North Pole Observatory where you get to experience Elf-Ray Vision. Finally, the kids will get a chance to meet Santa and share their wishlist. You can purchase a photo print to capture the memory. This isn’t just an ordinary line to greet Santa, it’s a full experience the whole family can participate in while you wait. You can make a reservation to shorten your wait. Santa HQ is available in select malls across the country. It’s so much fun to pull out the decorations, set up the Christmas tree, string the lights, and transform your home for the holidays! Helping to keep you organized during the holidays and add to your decorating this year, grab a VELCRO® Brand Holiday Decorating & Organizing Kit! It’s an easy kit that has everything you need included to help you add that extra flair to your holiday decorations this year. 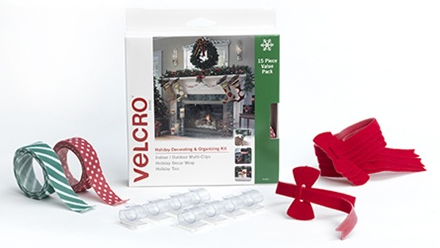 The kit includes (5) VELCRO® Brand Holiday Ties which make decorating a snap! Wrap them around a candle or hold together a handful of greenery with ease! Also inside are (2) rolls of Holiday Decor Wrap! Think the look of washi tape, but with functionality that can’t be beat! Finally, the kit includes (8) Indoor/Outdoor Multi-Clips to help string the lights inside or out with ease! The Holiday Decorating & Organizing Kit is just $15.99! What wonderful holiday gift ideas. I especially love those star marshmallow pop cakes on a stick. These are wonderful suggestions. Wearing Christmas jammies sounds fun. I like the inscribed jewelry. You have a great list… I feel like I am sooo behind this year, guess I need a list too! Love this list. Baked goods and warm clothes are always on my list. I always buy my kids Christmas pjs. It is a tradition that I want to keep doing even when they are older. Making a list is a great idea. I haven’t read The Polar Express but I do love the movie. I need to make a list yet. These really are essentials to have for Christmas! I didn’t think of The Polar Express, what a treasured film. This a great list! Our family is going to love music nights around a piano like that soon! Man, you’ve covered it all. I went through my drawer yesterday and realized I need new tights this season. I need to get on that soon, it’s getting chilly. Yes, I need a cute new jammy set for Christmas for all of us! Great idea. What a great list! We definitely always visit Santa! You certainly thought of everything! I need to go order my Christmas cards.